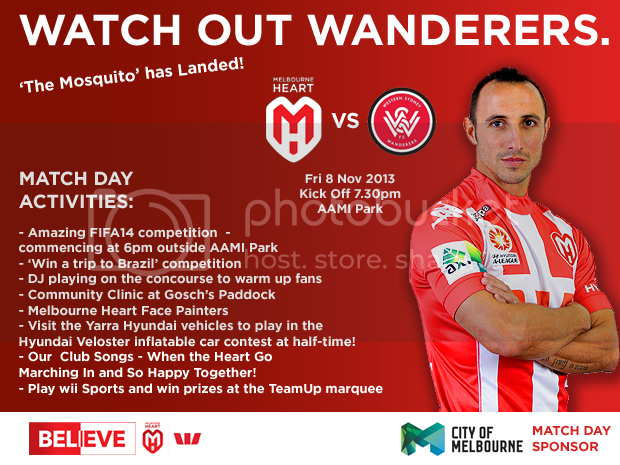 Melbourne Heart FC fans can enjoy a number of activities at AAMI Park this Friday as the Club welcomes Friday night football against the Western Sydney Wanderers. At Melbourne Heart's first home game of the season against Central Coast Mariners, #HeartZone - a new fan engagement wifi solution that provides exclusive access to Heart content, competitions and discounts for those at the game - was launched. On the back of its success, the Club will again provide the service this Friday when Melbourne Heart returns to AAMI Park to challenge Western Sydney Wanderers. HeartZone is designed to enhance the digital engagement of fans within the stadium and improve their match-day experience. In addition to accessing live match day stats, spectators will also have limited wifi access to sites that allow them to share content such as Facebook, Twitter & Instagram. HeartZone is only available inside AAMI Park & fans are encouraged to log on when they arrive at the match to make the most of the unique competitions throughout the match. This is a one game trial for the service with a view to future use. This Friday there will also be a number of other activities, including a FIFA14 competition and much more.